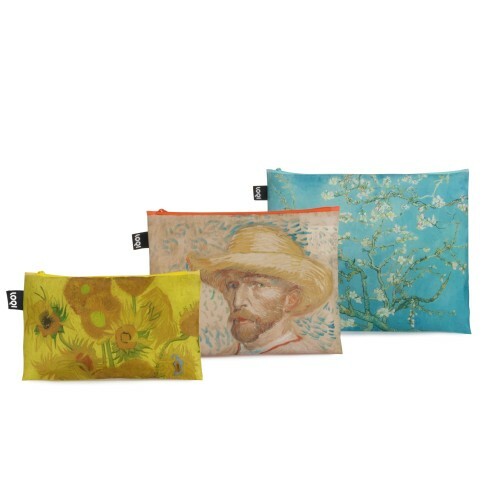 The Van Gogh Museum teamed up with highly-acclaimed LOQI to bring you a fusion between art and fashion. These fabulous zip pockets can be carried wherever you go. Lipstick, a toothbrush, and clean underwear. Passport, camera, and warm socks. Cellphone, wallet, and keys. Each new adventure calls for its own set of tools. Pack small and go big! Water resistant | Set of 3 zipper bags | Sizes: 23 x 13 cm, 27 x 19 cm en 31,5 x 24,5 cm.